Astrophysicists have long suspected black holes act like wormhole tunnels between two points distant points in the universe. Black hole researchers at the University of Massachusetts Dartmouth have now revealed some types of black holes open up new possibilities for space travel. Until now, the general scientific consensus was spaceships attempting to dash through a black hole would surely face a grim end. However, black holes such as Sagittarius A*, which sits at the centre of the Milky Way, might interact with physical objects in a completely different manner. According to Gaurav Khanna, from the University Of Massachusetts Dartmouth, large and slowly spinning black holes like Sagittarius A* might allow for safe passage. In a research article published in The Conservation, the scientist said: “The reason that this is possible is that the relevant singularity inside a rotating black hole is technically ‘weak’, and thus does not damage objects that interact with it. 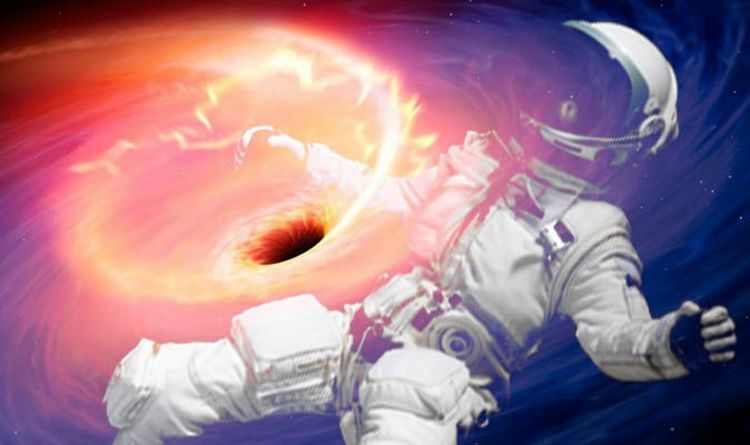 Together with fellow scientist Lior Burko of Georgia Gwinnett College, the physicists studied whether or nor astronauts can survive ventures into black holes. The peculiar question was posed after the success of Christopher Nolan’s 2014 blockbuster film Interstellar, where a space traveller played by Matthew McConaughey falls into a black hole. Based on the work of astrophysicist Kip Thorne, the scientists found a black hole’s size is a crucial factor in the equation. Dr Khanna said one of his PhD students, Caroline Mallary, built a computer model which simulated the effects a black hole has on spacecraft. He said: “What she discovered is that under all conditions an object falling into a rotating black hole would not experience infinitely large effects upon passage through the hole’s so-called inner horizon singularity. “This is the singularity that an object entering a rotating black hole cannot manoeuvre around or avoid. “Not only that, under the right circumstances, these effects may be negligibly small, allowing for a rather comfortable passage through the singularity. What Ms Mallary also found, was a rotating black hole would violently stretch and squeeze as spacecraft like a rubber band. But for a sizeable black hole, much like the one in Interstellar, the effects of this singularity would be ineligible. There is, however, one major drawback to the study and the theories it proposes – there is no way to test the hypothesis in lab conditions. The closest supermassive black hole we know of, the one in the Milky Way, sits roughly 27,000 light-years away – 158,722,890,000,000,000 miles.